Estonian composer Heino Eller’s piano music – a total of some 206 pieces – is not only the largest part of his output, but also the most substantial collection of works in Estonian classical music. Despite this, and the sterling efforts of Toccata Classics, who have so far brought out six volumes devoted to his piano repertoire, with three more in the pipeline, most of his oeuvre still remains surprisingly unknown. While most of Eller’s piano works are miniatures, he did write four extended sonatas, a set of variations in B minor, and the Sonatina in G minor (1946), which opens this new volume in Toccata Classic’s series. While this work is one from the Soviet period, when Estonia found itself once again under Soviet occupation, seen overall the CD features a broad span of the composer’s output, from 1910 to 1965, and which gives an ongoing insight into Eller’s development as a composer. The Sonatina in G minor is a conventional three-movement work, where the emphasis is always on lyricism and expressive melody, leaving a more cheerfully-conceived rondo to round things off most effectively. A quick glance at the titles of some of the short works to follow – Ballade, Fantasie, Étude, Impromptu, and Valse – reveals a distinct early-on interest in the Romantics, and particularly Chopin, although the second work on the CD, the Ballade in B flat minor, also looks further forward, to the world of Liszt, both in harmonic language and the complexity of the piano-writing, a trait which the next work, the Fantasie in F minor takes further, with lyricism per se often giving way to moments of true passion. Although Eller was a violinist by profession, he did write Six Études for the piano, of which the F minor one from 1916 is a fine example and most effectively written for the instrument. The Impromptu in B flat minor is everything you’d expect from its Chopin template – fioriture, and a contrasting dramatic middle section, with a cantabile melody supported by an arpeggio bass. Similarly, the Valse in B flat minor shares much stylistically with any medium-paced waltz from the Polish composer – even to the point where the opening melody is strongly reminiscent of the first main melody in Chopin’s Fourth Ballade. Eller’s Klaverimuusika rahvatoonis (‘Piano Music in Folk Tone’) emanates from the folk-like strand in his music of the Soviet period, beginning with the Thirteen Pieces on Estonian Motives of 1940-41 – works that necessarily conform to the ubiquitous requirements of the official Soviet cultural doctrine – Socialist Realism. ‘Piano Music in Folk Tone’, which appeared some 25 years later, is a more loosely-assembled collection of pieces from the 1960s, alongside works from earlier cycles. 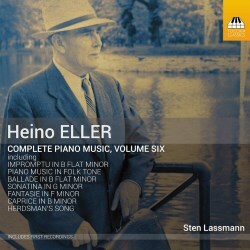 While this amalgamation of some 14 pieces is somewhat more varied in terms of compositional quality, and, being Eller’s last writing for the piano, does not always exude quite the same wit and simplicity of some of his earlier pieces, it still manages to contrast some of the composer’s easiest, and most accessible music, with some far-more technically challenging items like No. 14 (Allegro capriccioso) [Track 20]. It is interesting to note that Eller chooses Muusikaline hetk, rather than ‘Musical Moment’ in F sharp minor, as the title of the next piece on the CD, as this coincides with a time when the composer was looking for a distinctly Estonian content for his compositions. The work makes reference to a classic choral song, Kannel, by one of Estonia’s national choral-music founders. The Scherzino in B flat minor is charmingly fleeting and ephemeral, while the initially similarly-delicate Caprice in B minor moves, according to pianist Sten Lassmann’s helpful and informative sleeve-notes, somewhat into the realms of Scriabin for its middle section. The penultimate track – Karjase laul (‘Herdsman’s Song’ – shows Eller trying out a folk-like style, which begins plaintively enough in the minor key, but then moves into a jolly little peasant dance in the major, though this is curtailed somewhat abruptly, to allow for a reprise of the start. Similarly, La fille du nord’ (‘The Northern Maid’) is another folk-inspired miniature, which, at times, is reminiscent of Grieg’s ‘Anitra’s Dance’ from Peer Gynt, but in Eller’s case, he rounds the whole thing off with an effectively virtuosic coda. First and foremost, Eller’s music here is eminently listenable, with a real variety of style and idiom guaranteed to hold the listener’s attention for all of the CD’s 64 minutes or so. The writing is eclectic, but it shows Eller exploring different genres as he forges his own personal style, which at times was no easy thing, given the unnatural restraints during the period of Soviet occupation. Here are links to two further MusicWeb International reviews – Volume 1 and Volume 2 – where leading Estonian pianist Sten Lassmann’s superb, and totally empathetic playing is again as convincing in performance as it is here on Volume Six – enhanced, of course, by the excellence of the recording itself. A lot of smaller independent record companies do feature works by composers who, for whatever reason, appear to have dropped off the musical radar. That Toccata Classics has already invested sufficiently to release six out of a planned series of nine CDs of Heino Eller’s piano music alone, is a real expression of tremendous faith, and confidence in this still largely peripheral composer from the Baltics. Hopefully, though, this situation will alter, given the fullness of time.